Discussion in 'Cooking Knife Reviews' started by haole, Jul 9, 2011. We recently did a deep clean of our kitchen, and I found this knife wedged between a tilt skillet and the wall. All in all, it's not I'm bad shape. I have a strong feeling it belonged to one of out chefs who passed away, but it has a serial number on the other side. If possible, I'd like to try to see if it's registered, but Im not sure what brand it is. 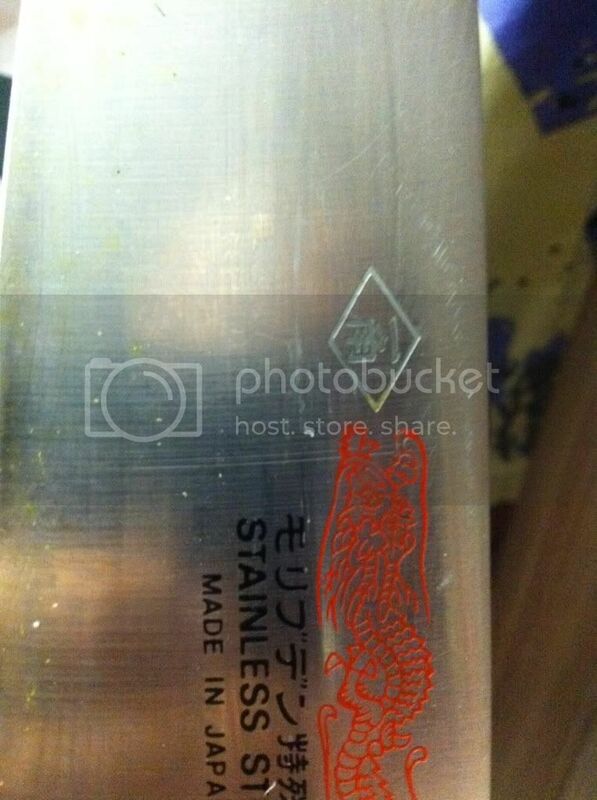 That's a picture of the etchings on the blade that isn't the serial number. From what I'm told it translates to Moribuden katakana, bit I can't find anything under that on google. That's Japanese for molybdenum, so it's molybdenum stainless steel. 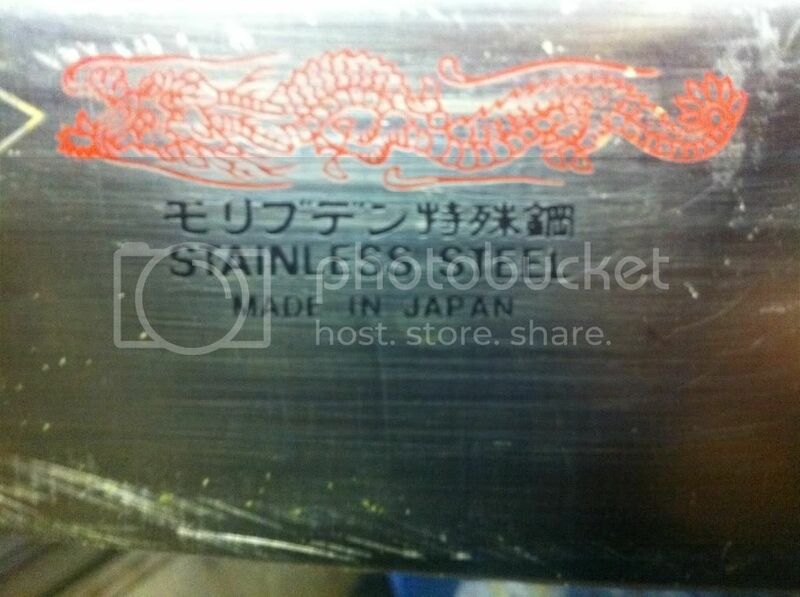 Don't know about the brand though -- molybdenum stainless is not that uncommon a steel in Japanese kitchen knives. Maybe posting photos of the whole thing would help? The knifemaker is "Ichikaku." Current prices for Western chefs run from ~6600-12000 yen. It's not a special edition or collector's item, nor an especially valuable knife. 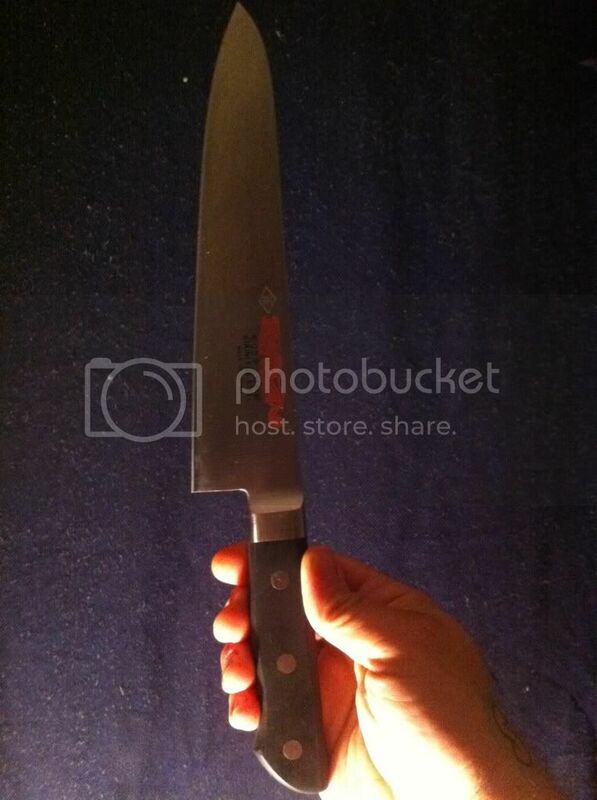 Just an ordinary mass produced, serviceable kitchen knife in the Japanese Western chef "gyuto" pattern. Let us know how it performs. It's not bad a bad knife, but I feel it's a little pricy. It feels really solid, and the handle is comfortable. The blade is a little bit thin for my liking, but that's my personal preference. I'll use it for a little while to how it keeps it's edge. Thinner is better for most knives. It is a Seki City company so it is probably a decent knife. Just not a super high end one. I take it that this knife is the kitchen that you own, where? In any case, that is a handsome looking knife.